Beautiful, new 3 bedroom, 3 bath, fully furnished town home for rent. 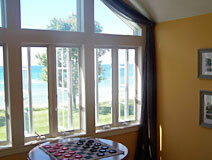 Walk out to 260 feet of private beach on the spectacular shores of Lake Michigan with no bluff to climb! Relax and enjoy the views from the large lakeside deck. Wide, sandy beaches invite you to stroll both north and south along the lakefront for miles. Enjoy the picturesque 1 1/4 mile walk down the wide sandy beach to the channel entrance to Portage Lake. Enjoy your vacation in style in this 2,300 square foot high-end "home away from home" featuring a full-line Kitchen with dishwasher and microwave, Laundry Room with washer/dryer and Living Room with cathedral ceiling, fireplace, cable TV and stereo. Want solitude? 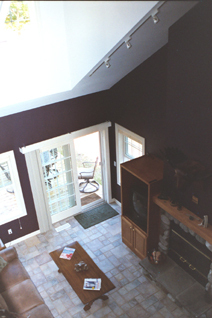 How about a quiet upstairs	vaulted ceiling Veranda Room with a full glass wall over looking the lake! Sit and gaze out over the lake or read in the two cushy chairs with ottomans. 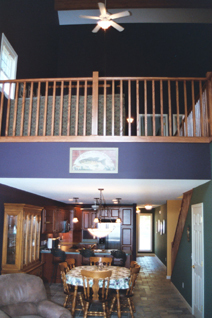 The 2nd floor cathedral ceiling loft/den has a queen-sized sleeper-sofa and entertainment center with TV/DVD/VCR and open railings, which offer a spectacular view down to the living room below. 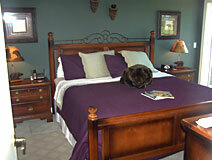 Awesome master suite with a king sized bed, nightstands, dresser & bath with a 6' tub and separate shower! Bedroom #2 features a queen sized bed and Bedroom #3 is filled with (2) twin beds (one with a trundle) making 3 single beds. Relax in comfort surrounded by dramatic northwoods decor including Michigan fieldstone fireplace, distressed leather sofa and recliner, plus TV/DVD/VCR & stereo.